In 1901, a group of divers excavating an ancient Roman shipwreck near the island of Antikythera, off the southern coast of Greece, found a mysterious object. At first they thought it was a scuba-diving Bruce Forsyth but after some probing it turned out to be a lump of calcified stone that contained within it several gearwheels welded together after years under the sea. The 2,000-year-old object, no bigger than a modern laptop, is now regarded as the world's oldest computer, devised to predict solar eclipses and, according to recent findings, calculate the timing of the ancient Olympics (this year's schedule will be made available in the Radio Times). Following the efforts of an international team of scientists, the mysteries of the Antikythera Mechanism have now been uncovered, revealing surprising details of the object that continues to mystify. Dated back to the early 1st century BC, technological artefacts of similar complexity and workmanship did not reappear until the 14th century, when mechanical astronomical clocks were built in Europe. 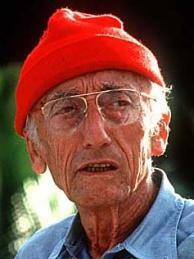 Among those fascinated by the device was the diver Jacques Cousteau, pictured above, who visited the wreck for the last time in 1978 but found no additional remains of the mechanism, the trip proving further frustrating when he cut his wetsuit on a jagged sponge. "In terms of historic and scarcity value," says one expert, "I have to regard this mechanism as being more valuable than the Mona Lisa." Whether it beats a Rolf Harris is debatable.